Investigators and Associates register for an account that enables access to the other applications (CTSU, OPEN/IWRS, Rave, CTEP Enterprise). Provides a variety of services, including institution and person roster support; website support for posting of protocols and other information; and links to other services (OPEN/IWRS, Rave). Conducts IRB review of most early-phase NCI-sponsored trials, including ETCTN studies. Linked applications for patient enrollment (OPEN) and slot reservations and cohort management (IWRS). Data will be automatically transferred to Rave. An application for data entry, data analysis, and clinical trial management. An application for integrated clinical trials management and reporting, including Serious Adverse Event (SAE) reporting through the CTEP-Adverse Event Reporting System (CTEP-AERS); ordering of investigational agents; trial monitoring/audits; and Operational Efficiency Working Group (OEWG) reporting. 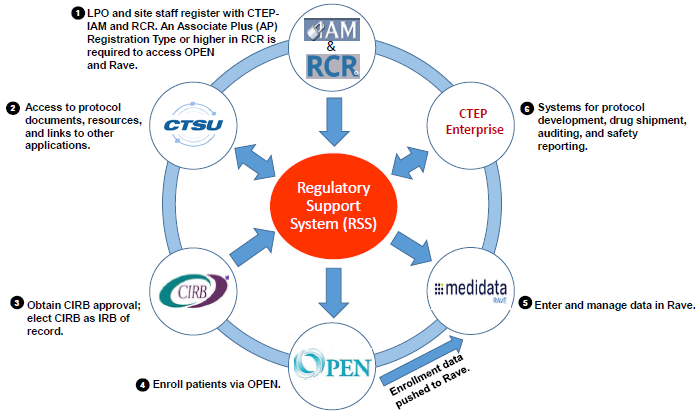 Serves as a centralized repository for the regulatory documents for all NCI-supported multi-center clinical trials. The RSS provides a streamlined and comprehensive approach to collecting and maintaining site registration, person, and institution documentation essential to the management of clinical trials.